IAS and IPS are the two most challenging jobs in India, which not only gives power and position but has certain duties towards the nation and responsibility towards society. Indian Administrative Service (IAS) is regarded as the top-ranking civil service job offered to those candidates who top the Civil Service Examination. Next, best alternative after IAS is the Indian Police Service (IPS) which is also a dream job of many Indian citizens, but it is a technical job, which requires maintaining peace and order in the state and direct interaction with anti-social elements. Civil Services Examination is the toughest examination, that is carried out in India, in three levels, i.e. Preliminary, Mains and Interview, by Union Public Service Commission. It recruits various officials for the different post in the government departments which includes Indian Administrative Service (IAS), Indian Police Service (IPS), Indian Engineering Service (IES), Indian Foreign Service (IFS), etc. 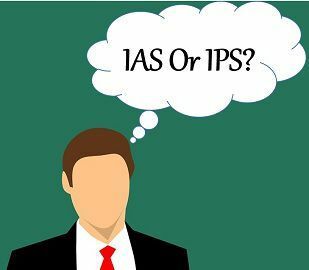 The article excerpt will help you in understanding the difference between IAS and IPS. Meaning An IAS refer to the primary civil services in India, that work as the administrative branch of All India Services. An IPS implies the protective arm of All India Services, whose cadre are absorbed by both Central and State government. Role An IAS officer is responsible for the public administration and policy formulation and implementation. An IPS officer takes the responsibility of maintaining law and order, and preventing and investing the crime in the area. Allotment to Candidates Those candidates who hold top rank in the Civil Service Examination. After appointment of an IAS, the other top rank holders are appointed as IPS. Training Academy Lal Bahadur Shastri National Academy of Administration, Mussorie, Uttarakhand. Sardar Vallabhbhai Patel National Police Academy, Hyderabad, Telangana. Cadre Controlling Authority Department of Personnel and Training, Ministry of Personnel, Public Grievances and Pension. Ministry of Home Affairs, Government of India. Departments An IAS officer works in several government departments and ministries. An IPS officer works in Police department. IAS stands for Indian Administrative Service, earlier called as Imperial Civil Service, is the bureaucratic wing of All India Services. A person can become IAS, by not only qualifying the Civil Services Examination but also getting a top rank in it. The examination is conducted every year by Union Public Service Commission (UPSC). When a candidate qualifies IAS exams, he/she is appointed as a sub-divisional magistrate, for the probationary period. After the completion of that period, the officer is promoted as District Magistrate and Collector for a few years, after which the officer will take charge as Divisional Commissioner, who is the head of the entire State division. An IAS officer may also be posted at apex level in the Central Government as Joint Secretary, Additional Secretary, Secretary and Cabinet Secretary. The primary duties of an IAS officer are the formulation of policies and their implementation, public administration, secretarial governance and so forth. An IAS officer is responsible for the collection of revenue and also working like Courts to settle matters related to revenue. He/she is also responsible for implementation fo the policies formulated by the Centre and the state. Indian Police Service or IPS, formerly known as Indian Imperial Police, is the top-ranked officer of the Police Department. An IPS officer is Civil Services qualified aspirant who serves the nation by leading the police force both at the State and Central level. An IPS officer is also the leader and commander of the Indian Intelligence Agencies and Central Police Organizations such as Intelligence Bureau (IB), Central Reserve Police Force (CRPF), Border Security Forces (BSF), Central Bureau of Investigation (CBI), Research and Analysis Wing (RAW), National Security Gaurd, Vigilance Organization, etc. The basic duties of an IPS officer include law enforcement, public order, crime investigation and security intelligence. The Ministry of Home Affairs (MHS) looks after its Cadre management as well as the policy decisions regarding the cadre structure, hiring, appointment, deputation, salary, allowances and perquisites, etc. IAS or otherwise called as Indian Administrative Services is the top-notch civil service, that works as the administrative wing of the All India Services (AIS). In contrast, IPS stands for Indian Police Service is one of the three branches of All India Services, whose cadre get appointed by both Central and States. IAS is the first choice of the most of the Civil Service aspirants, as well as the top-rank holders in the Examination, are appointed as IAS, whereas the second highly preferred alternative is IPS and after appointing IAS officer, the next top-ranked are posted as IPS officer. Training to IAS officer is given at Lal Bahadur Shastri National Academy of Administration, Mussoorie, Uttarakhand. On the other hand, the IPS officers are trained at Sardar Vallabhbhai Patel National Police Academy, Hyderabad, Telangana. The Cadre Controlling Authority, of IAS, is Department of Personnel and Training, Ministry of Personnel, Public Grievances and Pension. On the contrary, Ministry of Home Affairs, Government of India is the IPS Cadre Controlling Authority. While an IPS officer works in Police Department, an IAS officer gets an opportunity to work with various government departments and ministries. When it comes to salaries, the pay of an IAS officer is comparatively higher than an IPS officer. There is only one IAS officer in an area, however, depending on the crime level and area of the district, the number of IPS officers in an area may vary. IAS officer is superior to an IPS officer, as an IPS officer reports to the IAS of the area. The eligibility criteria is same for both the positions, i.e. the candidate must be a citizen of India, graduated from a recognized university and should have attained the age of 21 years. By and large, both the posts are very inspiring in nature, as the two encourages you to serve your nation. Every year lakhs of students appear for UPSC exam and study 24×7 in order to become an IAS or IPS officer. These titles not only hold power and authority, but also gives recognition and respect in the society. Very well displayed the content… One can get the full and detailed information. Very well and clear explanation. Thank you !